Slovenia, deservedly, are the champions of EuroBasket 2017. 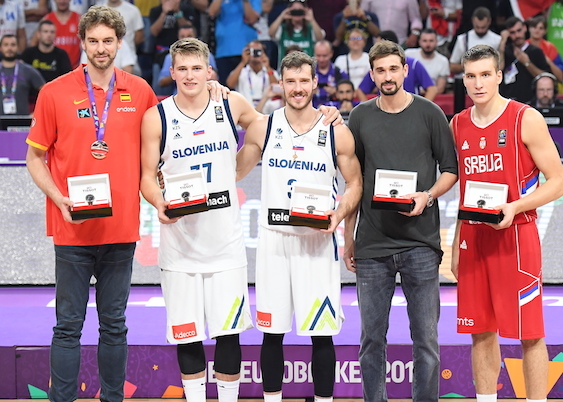 It was a title claimed with endeavour and execution at the close of a pulsating final in Istanbul which was decided almost at the last with Goran Dragic scoring a game-high 35 points as Serbia were defeated 93-85. The Green Army erupted in unison. As well they might. 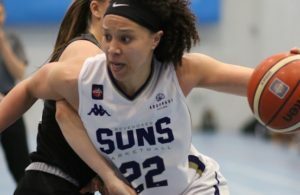 Heroes, some obvious, others unsung, stepped up amid extreme adversity when their star could give no more in the closing minutes. In the past, they had shared such glorious nights with the rest of Yugoslavia. This time, for the first time, the prize was theirs alone to cherish as the Slovenes completed the most unexpected of unbeaten 9-0 runs through this tournament. A population of two million rejoiced, led by their 12-strong national side and the lucky few on site at the Sinan Erdem Arena to witness a rich history in the making. What a team, in every sense. “It was a really unbelievable day for Slovenian basketball,” said victorious head coach Igor Kokoslov. “The main thing for us was focusing on the game, the little things. Our main thing was that we didn’t change anything. We just do what we do, that we should never come out of character as a team and become individuals, stick with the plan, stick with our philosophy and get a chance to win. A nervy, scrappy opening gave way to an offensive explosion. 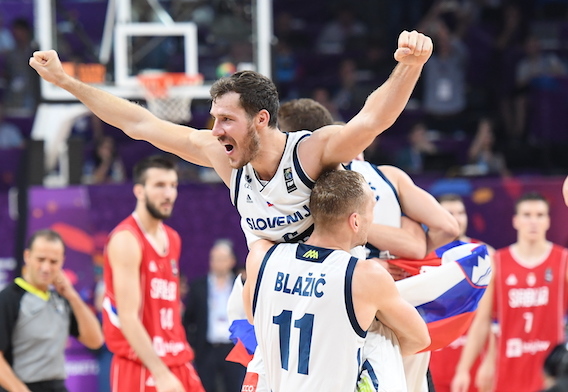 Dragic, the undoubted Most Valuable Player of the Tournament, had 20 of his international career-high tally in the second quarter as Slovenia used a 12-3 burst to roll towards a 56-47 lead as an astonishing half reached its close. 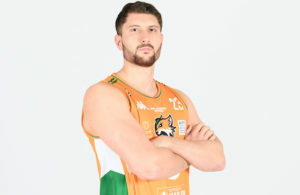 But although the Serbs had trailed by as much as 12, with Dragic temporarily on the bench and Luka Doncic carried to join him after the teenage tyro’s left ankle was turned stepped on team-mate Anthony Randolph’s foot, Slovenia found themselves under the cosh. An 8-0 run shifted the momentum over a three-minute spell that cut the deficit to 63-61 as Dragic urged his colleagues to awake once more. Upon his return, the burden was lifted but as the stakes were raised and tensions grew, Bogdan Bogdanovic buried a three that brought the three-times past winners within two before Dragic – shooting 12/22 from the field – downed two free throws to put his side 71-67 left entering the fourth. The Miami Heat guard, playing in what he insisted would be his last international appearance, was leaving nothing unspent, forced to briefly sit the aches took hold. 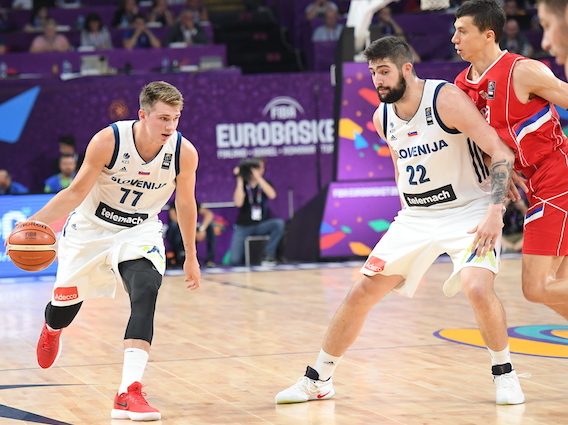 Jaka Blazic seized the initiative, providing a rapid resistance as Doncic remained idle but as the Serbs pressured, Slovenia’s composure appeared to waver. As their shooting went array, Vladimir Lucic stole in to make it 77-76 with 5:47 remaining and then Milan Macvan’s spin move in the paint took their team ahead for the first time since early in the second. Dragic, struggling, sat for good, a pained observer. His running mates fought manfully, a team united and resourceful. Klemen Prepelic downed a long jumper that forced Sasha Djordjevic to take a time out with just over two minutes left as Serbia trailed 84-82. Following second places at the Rio 2016 Olympics – and at the 2014 World Cup – they had felt this could be their turn to strike gold at last. However it was not to be. Bridesmaids again, despite a game-best 22 points from soon-to-be Sacramento King Bogdanovic. 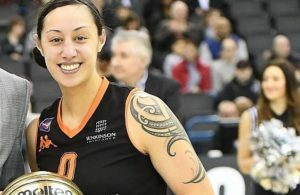 Prepelic, who scored 21, was possessed with valour in abundance amid a 10-0 run that ultimately ensured this fairytale run would be the ultimate dream come true. 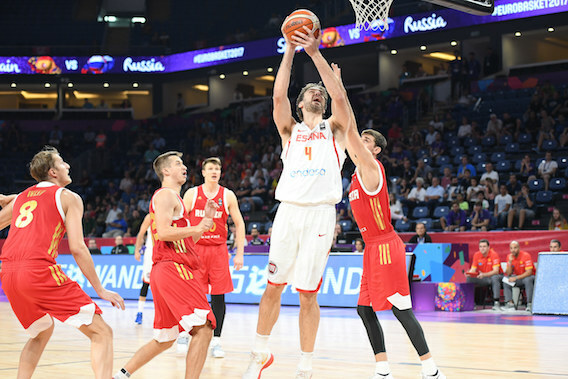 In the third-place playoff, Spain defeated Russia 93-85 to give Juan Carlos Navarro a winning send-off in his final game for La Roja. The dethroned champions led 45-28 at half-time but and went as much as 18 in front in the third. But with Ricky Rubio disqualified, the Spanish had to survive a late rally that saw their rivals reduce the gap to just two in the closing minutes before Pau Gasol – who had a game-high 26 points and 10 rebounds – and his brother Marc, who scored 25, made the game safe. Alexey Shved led Russia with 18 points. At the traditional end of tournament press conference, officials from FIBA conceded attendances at the final round in Istanbul and elsewhere have been poor compared to other recent EuroBaskets – due, they said, to Turkey’s poor performance and security concerns – while praising the quality of the venues. Organisers insisted the final itself was sold out but the official attendance was only 12.095. FIBA’s European branch has not started the bidding process for 2021 event with the likelihood it will begin next year. 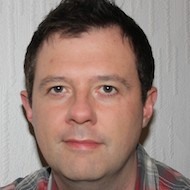 Whether the format continues with four nations splitting hosting duties remains undecided. Turgay Demirel, FIBA Europe’s president, insisted that the new calendar format will not devalue the 2021 edition when it will not qualify any team for future events. “Everybody will get used to it,” he said. Britain’s Robert Bald was chosen as the Match Commissioner of the final.